Todd Palin quit his job in the oil fields. WASHINGTON (CNN)– The 'First Dude' of Alaska will no longer be working in the oil fields. The Alaska Dispatch reports Todd Palin has quit his job with BP’s North Slope operation. The newspaper quotes BP Company spokesman Steve Rinehart as saying Palin submitted his resignation last month and officially resigned September 18. As a production operator, Todd Palin was responsible for management of the oil gathering centers, where oil is gathered from multiple wells. BP PLC is one of the largest energy companies in the world. 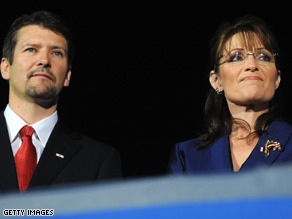 Todd Palin, the "First Dude" to former Governor Sarah Palin, shot to national fame along with his wife when she was named Republican vice presidential nominee. He also professionally races snowmobiles (known in Alaska as “snowmachines) and is a commercial fisherman. News of his resignation comes about two months after Sarah Palin's resignation from office on July 26. 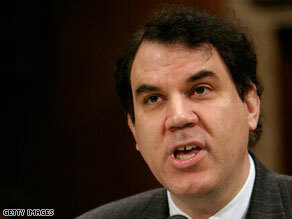 Rep. Alan Grayson's campaign is seeing an influx in campaign donations. WASHINGTON (CNN)– Rep. Alan Grayson's re-election campaign is seeing an increase in donations since his House floor speech last week in which the freshman Florida Democrat said the Republican health care plan calls for sick people to "die quickly." "The campaign has over half a million dollars in the bank and over 5,000 first-time contributors in the past three days," Grayson told CNN Saturday, saying he has his floor speech to thank for the influx of cash. "People want to see a congressman with guts," Grayson said. "[And] America likes to hear the truth." On Tuesday, Grayson called the Republican health care plan a "very simple plan." "Don't get sick. That's what the Republicans have in mind," he said. "And if you get sick, America, the Republican health care plan is this: die quickly." WASHINGTON (CNN)– Journalists are blasting President Obama over his stance on proposed legislation that would protect journalists from having to reveal the identity of their sources. In an email sent out late Friday, the Society of Professional Journalists expressed 'outrage' over President Obama's proposed changes to the shield bill that would protect reporters from having to divulge confidential sources in court. "Not long ago, President Obama was a key supporter of this bill, but after one meeting with his national security team he appears to have been scared into making this poor decision," SPJ President Kevin Smith said in a statement. SPJ cited an event in April 2008, where candidate Obama threw his support behind the proposed legislation, the Free Flow of Information Act. "President Obama was elected by the people, for the people. It's time for him to stand up and support legislation that gives those people the power to have better oversight of their government," Smith said. The Society of Professional Journalists, which was founded in 1909, has boast over 10,000 members nationwide. Its Their mission to promote "the free flow of information vital to a well-informed citizenry; works to inspire and educate the next generation of journalists; and protects First Amendment guarantees of freedom of speech and press." Lawyers for journalists have often cited a 1972 Supreme Court ruling to say they were protected by the First Amendment from having to testify about confidential sources. But in 2003, a federal appeals court judge said that ruling does not protect journalists. Thirty-six states (including Washington, D.C.) have enacted some form of shield law, but there is no Federal law protecting a reporter's privilege, which the sponsors of the Free Flow of Information hope to correct. 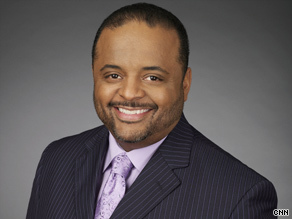 Roland Martin says conservative critics are wrong to chortle at the defeat of the Chicago Olympic bid. (CNN) - Whenever President Obama has traveled overseas and offered pointed and direct assessments of the United States, some of them critical, Republicans have ripped him for criticizing America, saying a president should always defend the United States. So I want to hear the explanation by these so-called patriots of their giddy behavior over the United States losing the 2016 Olympic Games. Yes, the United States. The bid that was rejected Friday by the International Olympic Committee was not a Chicago, Illinois, bid. It was the official bid submitted by the United States Olympic Committee and was representative of the nation. Tokyo's bid was that of Japan; Madrid's was that of Spain; and Rio de Janeiro's was that of Brazil. Republicans want to spin the decision as a massive loss by President Obama and the Democrats who have always controlled Chicago politics. "Hahahahaha," wrote Erick Erickson on the conservative "RedState" blog, "I thought the world would love us more now that Bush was gone." 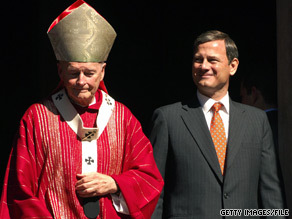 Washington's annual Red Mass, which celebrates the legal profession, will be held this year on Sunday, October 4 - the day before the Supreme Court begins its new term. Several justices traditionally attend, along with congressional leaders, diplomats, cabinet secretaries and other dignitaries. Past presidents have also attended, though there is no word yet on whether President Obama will appear. WASHINGTON (CNN) - Republicans say President Obama's health care plan will do nothing to help address the nation's crippling job losses. In the weekly Republican radio and internet address, Michigan Congresswoman Candice Miller calls for deeper tax cuts for small businesses and says the administration's stimulus plan has fallen far short of its goals. "...at a time when both parties should be squarely focused on getting Americans back to work, Democrats are actually redoubling their efforts to implement job-killing policies that will stretch family budgets even further and pile more debt on our children and grandchildren," Miller said. WASHINGTON (CNN)– Following a bruising loss of the 2016 Summer Olympics and a "sobering" September unemployment report, President Obama turned his focus back to job creation and health care reform Saturday in his weekly radio and internet address. Obama suggested reforming America's health care system will have the beneficial side effect of stopping the hemorrhage of U.S. job losses. "Rising health care costs are undermining our businesses, exploding our deficits, and costing our nation more jobs with each passing month," the President said. "So we know that reforming our health insurance system will be a critical step in rebuilding our economy so that our entrepreneurs can pursue the American Dream again, and our small businesses can grow and expand and create new jobs again."